In 1853, when it was in the planning stage, New York’s Central Park was to provide its mostly impoverished citizenry with an open country experience. It took Vaux and Olmsted twenty years to complete their assignment brilliantly. They carefully created open meadows, ponds, rocky chalets, vistas and made excellent use of the territory’s natural rocky ground. Near the northern end of the park they constructed a traditional glass conservatory. It had to be dismantled in 1934. Eventually, its former location was turned into three enchanting formal gardens. In spring, each one of these has a magic of its own. The southern-most of the gardens is dedicated to Frances Hodgson Burnett, the author of The Secret Garden. This fairy tale relates the story of two children whose loneliness, estrangement and illness dissipate when they find an abandoned garden among the lands that surround the palace that had become their virtual prison. Burnett wrote her popular book after she lost her son to tuberculosis. At the time the author too had found solace in a garden. A fountain group, consisting of Colin and Mary holding a birdbath, stands at the head of a small water-lily pool. Birds flutter to and from the birdbath. 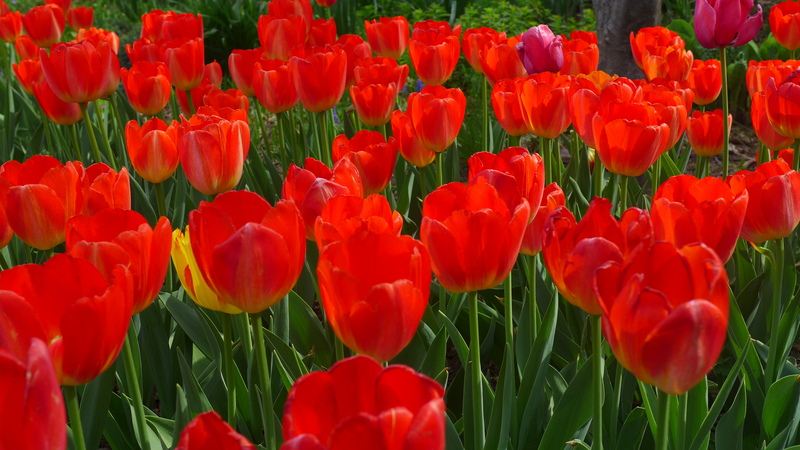 The pool itself is the center of an enclave overflowing with multi-colored tulips, daffodils and hyacinths. Two water-colorists, mothers, fathers, babysitters accompanied by toddlers and baby carriages, picnickers, and older folks with canes fill the benches. The air is perfumed and there is silence as if the visitors wanted to escape the very noisy city. While I was there nobody even used a cellphone. I progress to the Italianate center garden consisting of a lawn bordered by two allées filled with blooming fruit trees. At the time of my visit, a tent erected for an annual fundraiser covers the area. I continue north and reach a very formal French-style garden. 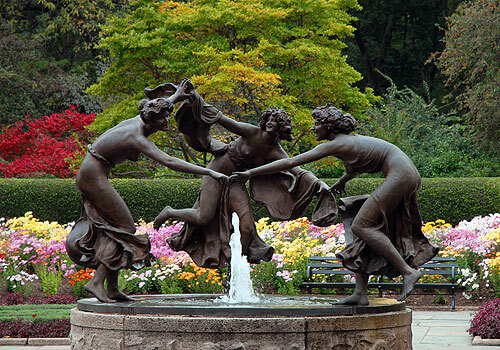 Rows of red and yellow tulips surround a pool centered on another fountain group: Three Dancing Maidens, by the German sculptor Walter Schott. The landscape is more open here, and only a handful of visitors fill the inviting benches. The Three Dancing Maidens are another reminder of New York’s past. At the turn of the 19th century they adorned the gardens at Greystone, Samuel Untermyer’s Yonkers estate. He made his money as a big-time corporate lawyer, but earned fame as one of America’s skilled legal reformers. Sixty gardeners and other personnel maintained its sixty greenhouses, formal Portuguese gardens, columned allées, wooden walkways, an amphitheater, pools and follies. During the 1960s, my family used to explore this “secret” decaying paradise whose mosaic walkways and pools were buried under tons of grass and debris. Once we fought our way down to the lower gate, guarded by a lion and a unicorn rumored to be relatives of those fronting New York’s famous public library on Fifth Avenue. William Welles Bosworth, who designed the gardens of the Rockefeller estate in Pocantico Hills, also designed Greystone. Workmen razed the Untermyer mansion in 1948 and the park slumbered, but remained a public park, described by the few in the know as “America’s greatest forgotten garden.” Today one full-time employee is restoring it. (See Eve M. Kahn’s “Reclaiming Wild Ambition Gone to Seed” in The New York Times, July 19, 2012.) It will always be as wild as Central Park’s Conservatory Garden is manicured, but both are part of the free outdoor playgrounds of the New York metropolitan area. 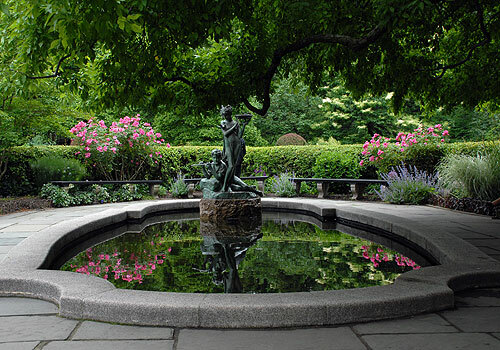 This entry was posted in Uncategorized and tagged central park, Conservatory Garden, Frances Hodgson Burnett, gardens, Greystone, kykuit, nature, new york, new york city, NYC, outdoors, parks, pocantico hills, rockefellers, Samuel Untermyer, Secret Garden, Three Dancing Maidens, Untermyer, Walter Schott. Bookmark the permalink. Very interesting, Suzanne! The Untermyer fountain is my favorite one in Central Park. This is the best photo I’ve seen of the Three Dancing Maidens. Do you know where I could purchase the photo for my home?